1. People forcibly pulled from the city of Madras like jasmine flowers from their stalks, constantly drunk on nostalgia spiced with sambar powder and served with a more milagai. 2. People eating questionable $6.95 idlis served with diet coke reminiscing about the oh-so-soft idlis at Murugan Idli store. 3. People eating unhealthy Bhelpuri while thinking about boiled peanuts, onions, tomatoes and Parrot-nosed-raw-mango served in a piece of The Hindu talking about a police drive to remove food vendors from Marina beach. 4. People staring at vast shelves of books filled with potboilers while dreaming about a heated price negotiation over George Orwell’s Animal farm (Rs. 20) with a potbellied old bearded man in Luz Corner. 1. You are married to a husband who forced you to move. you will find this report to be a reassuring reminder that Madras has not changed since the 80s. Not one bit. Really. Ok. Well, a few bytes perhaps. It used to be Auto City. It is still, Auto City. It used to be about cotton soft wear. It is now about buggy software. It used to be about potti kadais. It still is about potti-shaped monstrously large kadais in T Nagar. It used to be about affordable houses. It still is about affordable houses, 40 kms from the outskirts of villages on the outskirts of the city. Tindivanam city, I mean. And oh, the old 5-year Dravidian Ping Pong game is still on. And it has a slightly new map. 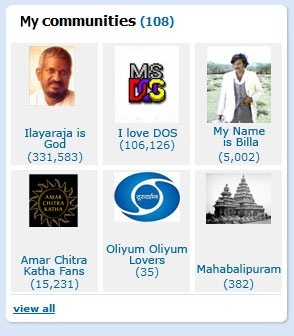 In fact, I took an Orkut profile snapshot of Madras (around the 1980s) and Chennai (2007). See for yourself. Some small differences, but still mostly the same. As you can see, dear refugees, your city hasn’t changed that much in all these years. Just in small subtle, unnoticeable ways. So I wish all of you a very happy near year. Now let me go grab a plate of sambar vadai from Kaiyendhi bhavan, pick up Douglas Adams’ Hitchhikers Guide to the Galaxy from the thaathaa at Luz Corner and go watch some over-decked maamis at The Music Academy make good use of this. Ashok: touche 🙂 Fixed now. I’ve been following your posts for some time now. And with each post you set an standard for others about how much effort should go into a *real* blog post. Perhaps the current Chennai lingo say: “Dis is Aaasome dude”? As an outdated exile I’d better stick to what Manorama would say in our days: “Yen raasa, imbutu nalla yeludiriye”. Best wishes for you and your blogfellas for 2008. You didn’t mention the mighty Almonard fans. Why the seemingly arbitrary 54 fans instead? 🙂 Thanks for the update! Madras is a warm, childhod memory; so that was nostalgia revisited. 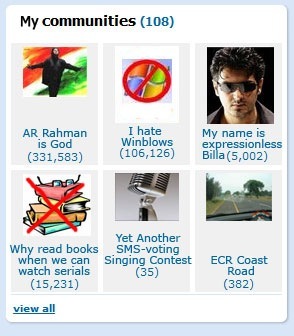 The Orkut profile is just swell!! A happy new year to you too. Hope we see more ‘n more jalsa on this blog in the coming year. post marital straight?! beauty piece i say! bhesh bhesh. Hehe.. Was wondering if like everything else in the US that is on vacation this week and next, if you were on vacation from blogging. Happy to see that I was wrong. In the 80s, the karigai kaaran was a happy loud-voiced vandi pusher on the road, now in most cases it is a much more prosperous south indian sitting in an air-conditioned Pazhamudhir Nilayam or Saravana Stores(hope I got that name right). Cabbage was Mutta Kos and always greenish whitish in color. Now it can also be purple and other colors. Cholam could refer to corn or baby corn and is better appreciated as baby corn manjoorian rather than the traditional sambal lae sutta types. Now, can we expect a post on the Indian Cricket Team’s recent performance in Aus? Only you can do true justice to a topic like this. its only 3 weeks since me been in chennai. . .
n was jus wondering if the traffic was ta same too…..
u know its possible to reach places faster than a share-auto if we walk!! Nice one dude….! Good post. thnx, very informative for non-chennaiites like us…. List of adjectives describing this(most) posts.. Happy New Years! Have a blast! I am not from Chennai….but i could relate to this post so well! Kalimark!! Man, that advert still haunts me! Hilarious post! Desperate: Need Blogger to give a Crow by Crow or Kaka by Kaka account as you would prefer of the Chennai HSBC Big Bird Race scheduled for the February 3rd.It is a Sunday.I am putting together a 4 person team for the event . The Mise en Place and the Mise en Scène has already begun. Please chk these links and call me asap. Need you on board for the race Dude. We will even consider chartering a helicopter and have Karun Chandok drive us around to accomplish our mission. Need your help to get your blogging brothers and sisters hooked. I notice from the comments section for each of your posts there is a lovely resonance. hehehe.. how did you manage those screenshots from orkut? I certainly hope you intend on writing a book, because your blog is completely addictive. The world needs more unpretentious Indian writers. I think theres quite a few of us who live vicariously through your blog when we miss Madras. Kudos! Great stuff. Keep ’em coming. Too good…that was amazingly creative! Keep it coming!! Iam quite becoming a fan of your style of writing.Nice write up. Niiiiiice 🙂 Am a refugee ‘coz of reason (2)…. boohoo…looking to run back home at the first opportunity. ‘Live in relationship (with tradition)’…LOL!!! 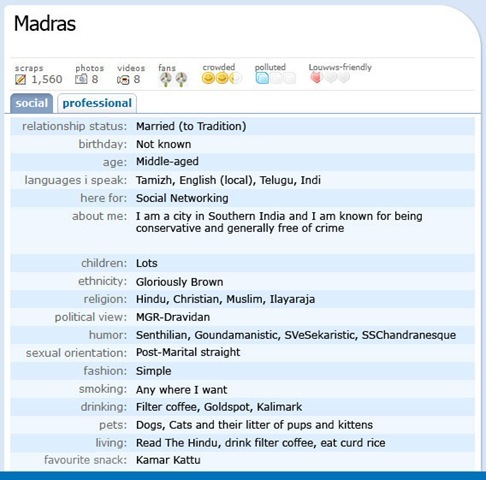 Loved the orkut part macha.